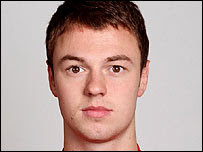 Manchester United (on loan to Sunderland) and Northern Ireland footballer Jonny Evans was the subject of a blog entry by me a few months ago. Today the Crown Prosecution Service announced that no charges would be made as there is insufficient evidence. Surprise, surprise. Jonny is a young lad, who committed no crime and was the subject of a media frenzy........his crime was the team he played for and nothing else.